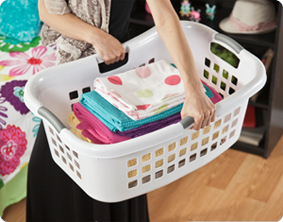 Make laundry day easy with the 1.5 Bushel Ultra™ HipHold Laundry Basket. It is designed with a contoured shape that rests comfortably against the hip for ease in transporting clothes to and from the laundry room. The reinforced rims and the durable design ensure full baskets will not bend or break. This laundry basket also features a modern contemporary look and feel with its polished finish. The ergonomic, integrated handles makes transportation comfortable while the stylish square hole pattern enhances airflow. When not in use, the laundry baskets stack neatly and nest together creating more efficient storage space in your home. 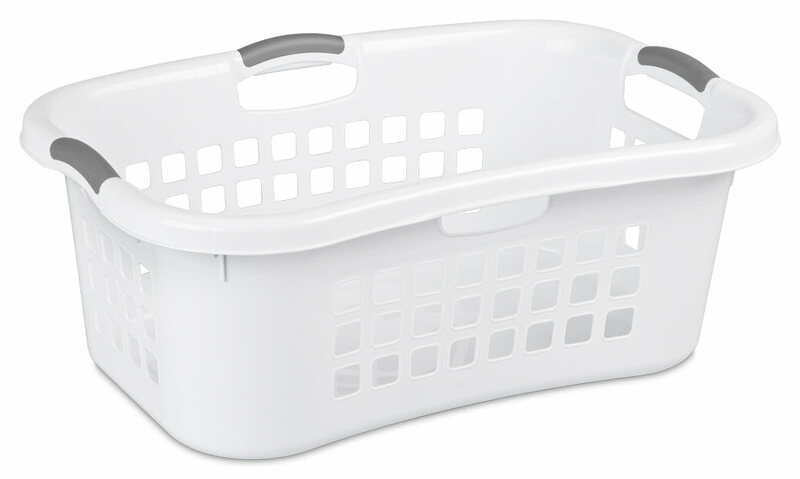 The overall dimensions of this item are 27 1/8" L x 19 3/8" W x 10 1/4" H.
Overall Assembled Size: 27 1/8" x 19 3/8" x 10 1/4"
Laundry is easy to carry throughout the home with the comfort contoured shape. 1.5 Bushel Ultra HipHold Laundry Basket is rated 3.9 out of 5 by 18. Rated 1 out of 5 by LTTT from Not durable Handles broke early on and currently held together with duct tape. Have decided to give up and throw them away(I own 2 and both broke). Will look for a more durable laundry basket. Rated 1 out of 5 by dc from Handles never stay on I don't understand the need for detachable handles. Why? And why won't they stay on? The truth is, I would pay more for a basket that lasted longer and worked better, but I suppose these have a built-in obsolescence. In any case, dumb. Rated 2 out of 5 by HangEm2Dry from FAILED QUALITY ASSURANCE I purchased several of these baskets, both for at home, and for a college student. None of them have held up. The baskets seem to be made of a flimsier material, and the handles snapped off within a few weeks of use. I started buying Sterilite products instead of Rubbermaid because I was disgusted with the quality of that product, and because the Sterilite product is made in the USA. Now I am back to square one. Unless Sterilite does a better QA check on their products at the factory, I am going back to wicker laundry baskets. Rated 1 out of 5 by KLECTOR01 from EXTREMELY POOR QUALITY I purchased the Sterilite 1209 laundry basket from Meijer. The very first time I put wet clothes in the basket, two of the three handles snapped and broke apart. I was unable to fix them as the plastic holding the handles completely tore apart. I would not recommend this particular laundry basket. Rated 5 out of 5 by PAT EVERETT from so handy I use my laundry baskets for everything. I have one I usee to pick uo grandchildrens toys and store them. I have some I keep crafts in. I also use it to transport foods. I also use one to keep empty food containers in . Is especially good to put laundry in. Thanks for a great product..